Today's hieroglyphic is the letter "U". 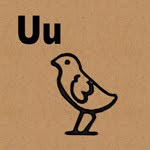 Here's an easy way to remember the hieroglyphic symbol for the letter U.
Quail chicks are so cute that they make you say, Ooo! Just think of "Ooo, how cute" and you'll have it!